for fear of the flood. 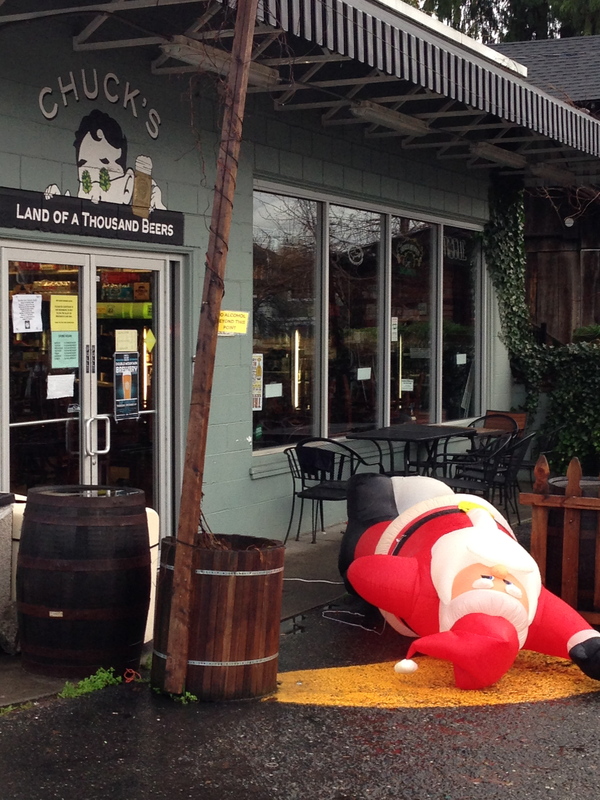 Santa had one too many. It took fourteen years, from start to finish, but I finally published novel #1. I started writing Pieces of Home in the year 2000. The first draft was 100 pages: a loose collection of scenes. I continued to add, subtract, tweak and refine for several years, then lay it aside for about a decade. During this time, people would occasionally find out I’d written a novel, and ask to see it, so I’d send them a PDF. After a half dozen or so people read it happily and told me they enjoyed it, with no complaints, I started thinking maybe it was time to publish it. So then I began a process that lasted 8-9 months, much like the gestation of a newborn. There was rereading, rewriting, confusion about ellipses and em dashes. I paid two different people to formally review and edit the book for me. I crafted the text and graphical content in Adobe InDesign CS5, and did the cover in Photoshop. My graphic design background must have paid off because my documents were approved by CreateSpace on the first try. Skye Thorson—poet, web designer and collector of spoon rests—comes home from public speaking class to discover her house has burned down. Still reeling from her divorce and the loss of her restaurant business, and with no trusted family to fall back on, she goes to stay with her classmate Iya Forsythe and his eccentric relatives. She soon finds herself intensely curious about the puzzling Forsythe family, headed by Orvie and his brother, Marlow. Thrust into the role of part-time parent to an eleven-year-old girl with anger management issues and a fourteen-year-old boy hung up on the contents of a jar in his desk drawer, Skye begins to find the strength to cope with her estranged brother, while picking up the pieces of her own life. Written in the form of a diary, Pieces of Home takes an honest but humorous look at the emotional factors that lead to homelessness, violence and trauma in families. How can I buy Pieces of Home? 1. You can purchase the book via Amazon in the USA, or in the UK, or France, Germany, Italy or Spain. At some point it will also be available in Canada. 2. If you have a CreateSpace account or don’t mind signing up for one, you can purchase it via this link. 3. If you would like a signed copy, please contact me directly. The cost will be $16, which includes shipping to anywhere in the USA. 4. There’s also a Kindle version coming. Some of you think of Amazon as this evil global empire, but I still remember when I moved to Seattle in the mid-nineties, and they were a cute local website that called itself “Earth’s Biggest Bookstore.” When they started selling Compact Discs (remember those?) I was thrilled. By the time they added Kitchen stuff and and Clothing, I was concerned they might be overdoing it, by by that point I was working in the tech industry myself. Convenience and good customer service won the day for me, both as an Amazon shopper and as a Print On Demand Author. The Print on Demand model really appeals to me, because the book doesn’t exist in a book shaped form until someone orders one, then they print it and ship it to you. I have a friend (Franetta McMillian) who used CreateSpace to publish two of her books, and I read about other authors’ success with it as well. The fact that they were willing to do an Editorial Eval of my book for just $199 was a big plus. I went with an independent editor for the nitty gritty editing, however, as it was much more affordable to do so. So if you are at inclined toward literary fiction with a comedic bent, I hope you will consider checking out my book. If you are on Goodreads, you can also find me there. It’s that time of year when many people feel obligated to join in the cultural tradition of decorating something with lights and hanging ornaments from it. Here’s an idea for your consideration: the Christmas Shelf. Especially useful for those who are short on space, or dislike the notion of killing a tree, the Christmas Shelf is ideally made from a wire shelving unit. If you are lucky, you have one of these in your house or garage already. You can press it into service as a symbol of holiday celebration by stringing lights around it, then hanging ornaments from it. And the best part…the presents fit right on the shelves! The katag — a white scarf used to give and receiving blessings in the Tibetan Buddhist culture — is a wonderful example of emptiness. In Buddhism, emptiness is an important concept. It points out that no person or object has a separate, inherent existence. We are all interdependent, connected, impermanent. Once you realize the emptiness of all things, there is no need to be attached to them in an unhealthy, clinging sort of way. When I got my first katag, it seemed like a big deal. I ironed it, smoothed out its fringe, and thought of it as “mine.” I put it on a shelf as a decoration, and there it remains. Oh, but I had a lot to learn. The next time I got a katag, I got a simpler one, with no fringe. I soon had the opportunity to actually “use” it, when visiting the Sakya Monastery of Tibetan Buddhism. I can’t remember the exact occasion, but I remember following everyone else up and leaving “my” katag on a table, as a way of honoring someone or something — again, I don’t remember exactly, all I knew was that “my” katag was no longer mine. I had given it away. Soon after, a friend lent me “her” katag to go up and receive blessings from Rinpoche. To my surprise, this time we were not leaving the katag behind…it was being returned to us right away. I asked my friend if she wanted it back and she said no. So I took it home and wondered what I should do with it. Should I hold on to it as a memory of the person who had blessed it? Should I wash the stain off of it? Soon the answer became apparent, because there was another occasion where a katag was appropriate to bring out and offer, and once again, I gave it away. As I continued to experience how katags are used in Tibetan Buddhism, a wonderful thing happened. I realized they belong to no one, and the blessings are shared by everyone. There is no “I” getting something in exchange for something, or giving up something to someone else. There is no “you” taking something from me or giving it back. We are all swimming in a sea of shared katags (and anything else you can imagine). So now I always try to have a katag in my purse in case I am in a situation that calls for its use. And what is it’s use? It is a symbol. It’s the idea of showing respect for someone or something. It’s the idea of being humble and generous enough to give. Sometimes we present them and they are put immediately around our necks. Sometimes we pile them up and leave them on the shrine or a lama’s table. Sometimes we see a pile of katags for sale and wonder if the one we gave away last time is in the pile somewhere, being recycled endlessly, like the water droplets that evaporate, turn into clouds and then rain back on us, a shower of endless, shimmering blessings.